There was a happening at Walt Disney Hall on Tuesday. Music was both played and given away. I learned Fidelity Investments not only accepts investments, it invests in its neighboring communities through arts education in public schools, and it's been investing in school children nationwide since 2006 through Fidelity FutureStage. The event held on the morning of February 9, 2010, at Disney Hall was one part giveaway, 4-city simulcast, 4 short awesome youth concerts, 3 celebrities (2 in L.A., 1 in Chicago) and 3 brilliant conductors (1 student and 2 pros). Add more than 1,500 students and you get a down-in-your-bones feel-good morning in Boston, Chicago, Houston and Los Angeles. Actor and self-described music prospector, Dominic Monaghan (Lord of the Rings, Lost, etc.) hosted. Oscar winning actor and classically trained pianist, Jamie Foxx (Ray, Dreamgirls, etc., etc.) closed the show in Los Angeles. Other participants around the country included Boston Pops Conductor Keith Lockhart, Houston Symphony Principal Pops Conductor Michael Krajewski and from Chicago actress Joan Cusack (Confessions of a Shopaholic, High Fidelity, etc.) 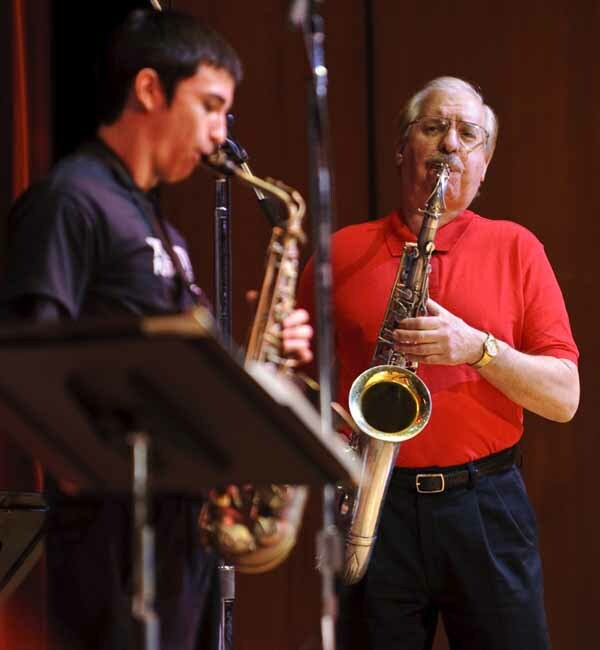 and Jazz Saxophonist Larry Slezak. Monaghan led the students in three cheers of "We love L.A." accompanied by L.A. Phil's Joanne Pearce Martin on the Walt Disney Concert Hall organ. From Symphony Hall in Boston, Peter Cieszko, president of Fidelity Investments Institutional Services Company, welcomed the four-city audience. 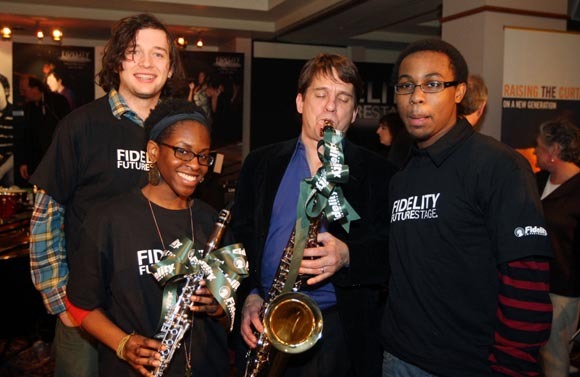 Cieszko described why Fidelity FutureStage was created and the striking results that can emerge when kids have a foundation in music education. Ciezko said research has shown that music education improves standardized test scores and leads to higher graduation rates. 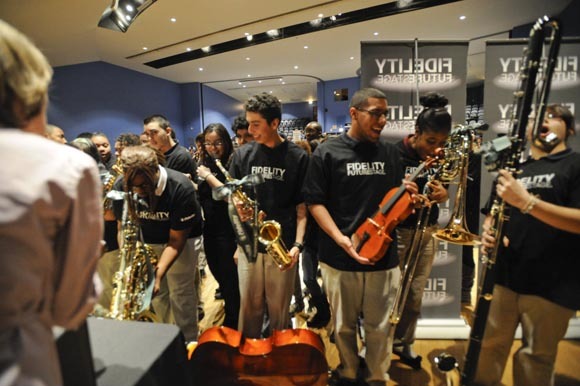 Since its inception in 2006, Fidelity FutureStage has fostered the mentoring of almost 20,000 students and donated 972 new instruments. 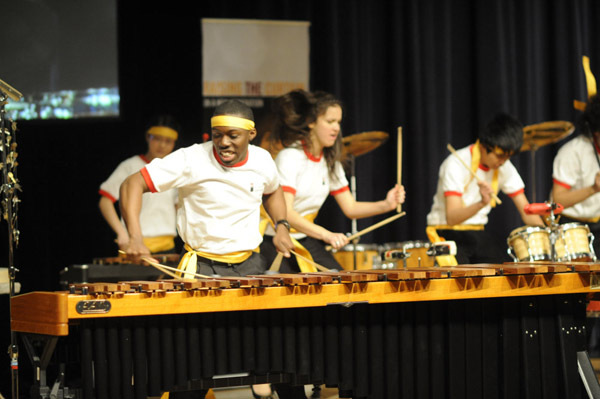 The simulcast concert with student performers treated the audience to four varieties of music. Jazz emanated from Jones Hall in Houston. Houston Symphony Conductor Krajewski introduced Laura Martinez, a graduate of the Fidelity FutureStage program who is an undergraduate music student aiming to wind up with a masters degree in Music Education to teach. The Chicago Symphony Orchestra PSG (Percussion Scholarship Group) brought it from the Kenwood Academy in Chicago and rocked four cities with a percussion performance imbued with so much physical animation that they really embodied the music whether they were playing drums, tambourines, xylophones or a few instruments I didn't recognize - one looked like a beaded gourd. 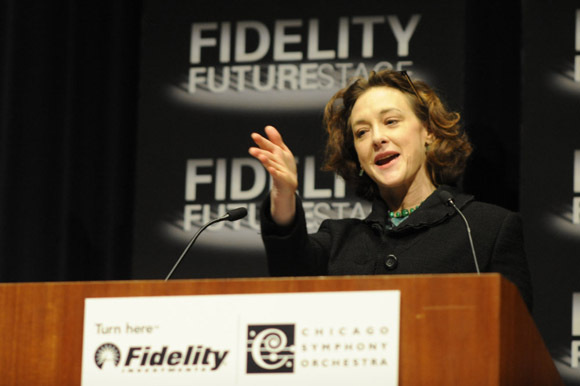 Joan Cusack advised the kids to "try different things to find the fit for you." Fortunately, for Joan, her athletic, mathematical Mom (who was sitting in the Chicago audience) accepted that she'd borne five artsy types and let each follow the beat of their own drummer. Cusack said: "I may not look like Lady Gaga, but I have a similar message: Celebrate who you are and listen to yourself." 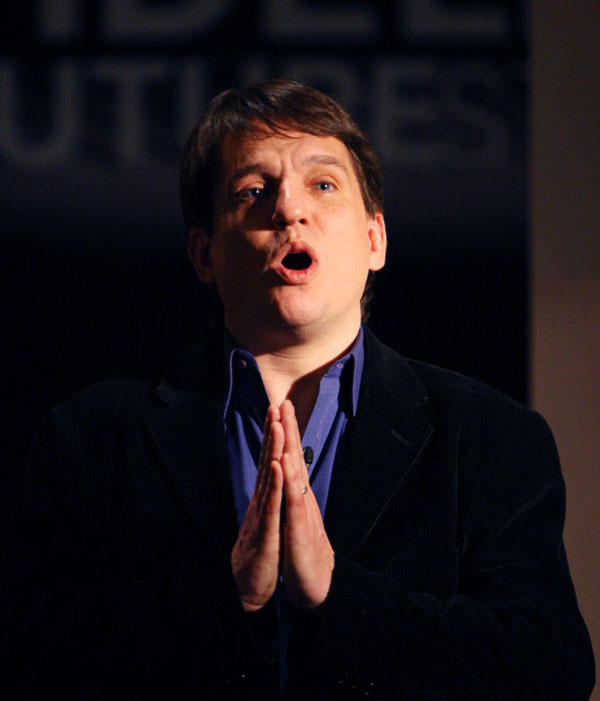 From Boston, the Boston Pops Conductor Keith Lockhart introduced two winners of its 2009 competition: AnJalique Perry, who sang a ballad from The Color Purple and Singer/Songwriter Chris Middleton, who accompanied himself on piano and sang one of his own pop songs backed up by a few Boston Pops musicians. Lockhart says that in Boston they teach students classical, jazz, the music of Hollywood and songwriting. He said: "If you play an instrument or sing in an ensemble, you learn about commitment." The concert ended with a classical performance by 100 students from Renaissance Arts Academy supported by a few musicians from the LA Philharmonic. It was the cherry on top of a perfect sundae and the musicians received a rousing standing ovation from the Disney Hall audience. And one talented ensemble from the FutureStage schools will be selected to perform at the Hollywood Bowl Opening Night Gala for a crowd of 17,000! 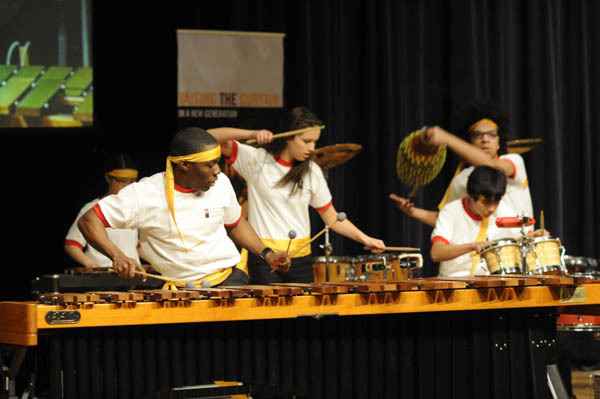 FutureStage schools in Boston, Houston and Chicago will have their own select performance with the Boston Pops, the Houston Symphony and the Chicago Symphony respectively. 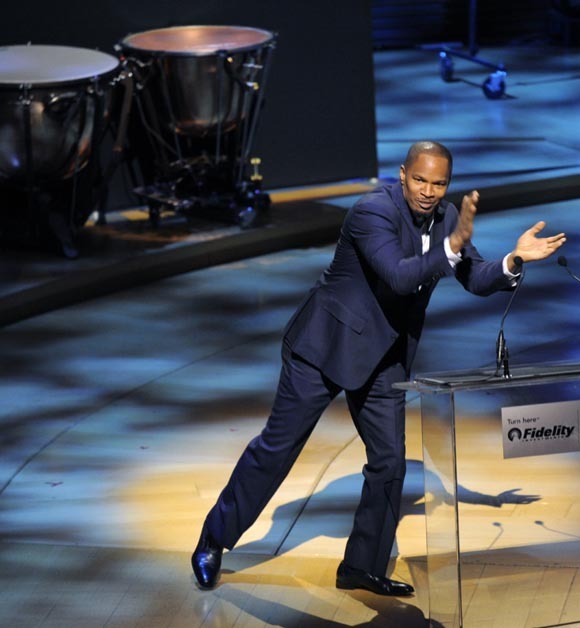 And just as I was pondering my need to get tickets to see both Dudamel and the FutureStage kids at the Hollywood Bowl Opening Gala - Jamie Foxx walked onstage. And as bright as Disney Hall was already lit up, Foxx upped the voltage. If he was a solar panel, Foxx could light up the neighborhood (but I don't think his Grandma would want him tied down on anyone's roof). When Foxx lightly imitated a bit of the classical aria (the notes were right on but the lyrics were gibberish), the kids in the house just ate it up (so did the adults). He said he had grown up in San Diego and studied classical piano at the United States International University on a music scholarship. 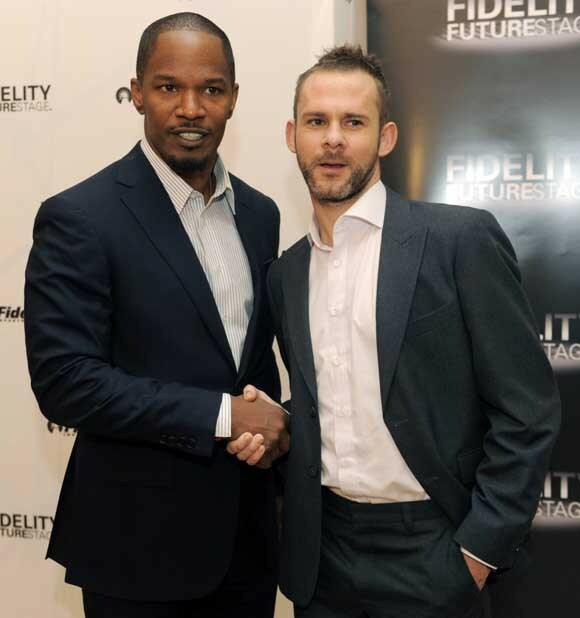 And then the coolest thing happened - just when I thought it couldn't get any cooler than Jamie Foxx entertaining the room. Fidelity FutureStage began giving away musical instruments - brand, spanking new musical instruments: violins, violas, saxophones, trumpets, clarinets, trombones, drums, xylophones, etc. 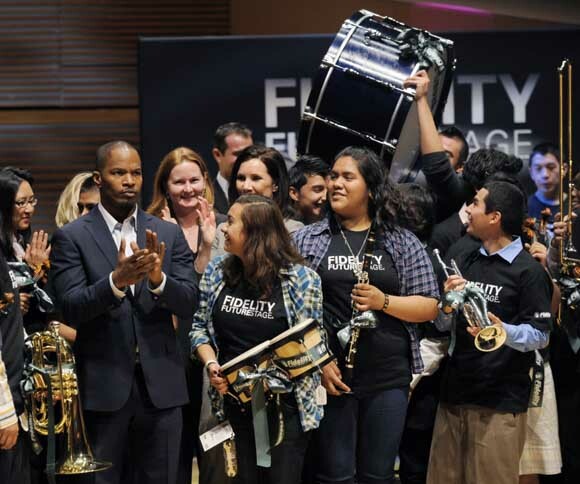 Instruments worth more than $100,000 were simultaneously presented to students in Houston, Chicago, Boston and LA as part of an overall donation by Fidelity to public school programs nationwide for a total gift of $500,000. When I spoke to Monaghan after the concert, I discovered he plays a bit of guitar and piano. It also turns out we share a passion for the same favorite group - The Beatles- except he has a tattoo and I don't. 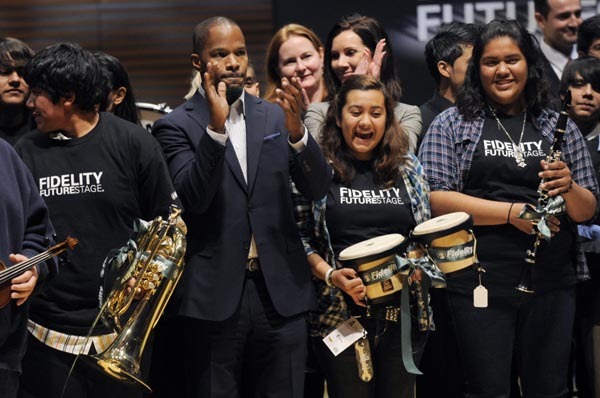 While waiting to speak to Jamie Foxx, I spoke to several students who were each carefully carrying one of the new musical instruments (Victor Ekbo, Sequoia Balboa, Melissa Quintanilla, Augustine Riviera and Benjamin Penzner). I learned two things: the schools own the instruments but the students get to play them until graduation and a violinist may not recognize a trombone (at least I thought it was a trombone, but I have no idea how to play it either). All five played string instruments (violins or violas), so they felt a bit out of place carrying a saxophone, a clarinet and a trombone. At last Jamie Foxx reached me at the end of the press line, and I asked what he meant when he told the kids he had accomplished much by doing what his grandmother told him to do. He said she made him made him practice piano an hour a day every day - even when he wanted to go outside and play - but his practice paid off and he got a music scholarship to study piano. Foxx said: "I wasn't the greatest student, but I learned a lot. I learned about people. I learned the music has no racial boundaries - no gender boundaries, and to be able to share music is a great thing. I would play jazz and funk and R & B while other people would play different classical things." As for the music we'd heard, Foxx said: "These guys are kids playing these very intricate pieces - it was amazing." So is Fidelity FutureStage. Now I just need to grab tickets for the Opening Gala of the Hollywood Bowl on Friday, June 18, 2010.